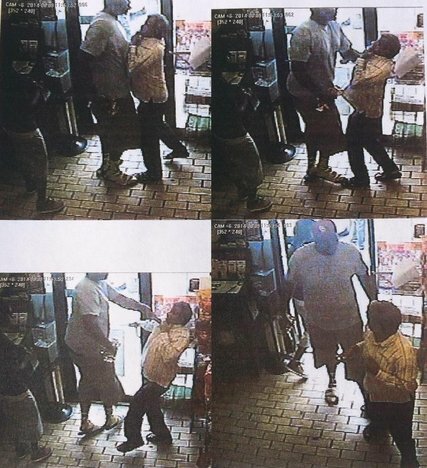 Ferguson police identified the officer who pulled the trigger, killing unarmed teen Michael Brown as well as images of who they believe is Brown robbing a man at a local convenience store. Darren Wilson has been identified as the officer involved in the shooting death of 18-year-old Brown in Ferguson, Missouri, an incident that spurred several nights of protests and mayhem in the St. Louis suburb. 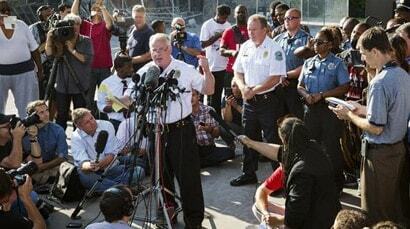 The Ferguson chief of police, Thomas Jackson, made the announcement Friday morning. He identified Wilson as a six-year veteran of the force and before the shooting, and has had no disciplinary action taken against him. Since the shooting, Jackson declined to reveal the officer’s name due to the uproar in the area and threats made toward him on social media. There are conflicting stories about what actually happened on that fateful Aug. 9 night. The official police story released to the media, Wilson shot Brown after Brown went after his service weapon. However, witnesses said Brown had already surrendered and was gunned down with his hands in the air. In addition to revealing the officer’s name, police released images of a strong-armed robbery at a convenience store that took place shortly before Brown was fatally shot. The incident report describes Brown is identified as the primary suspect in the robbery, as depicted in the images. The report details Brown, who has an accomplice nearby, Dorian Johnson, attacking a store clerk for a $50-box of cigars. Wilson, who has been on paid administrative leave since the shooting, was one of the responding officers to the incident.